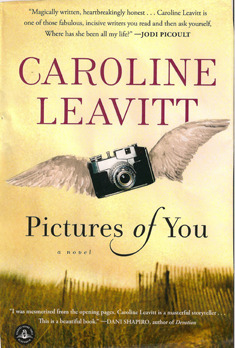 Pictures of You by Caroline Leavitt achieves what it sets out to do, and that’s really all you can ask of a book. It doesn’t strike me as being great literature, but it tells a moving story and it tells it well. There’s a bit too much crying for my taste, but . . . The story is about Isabelle who leaves her husband on the Cape when she discovers he’s cheating on her. She’s headed to New York but gets off the highway and is involved in an accident that kills April and puts April’s son Sam in the hospital. Naturally, Isabelle feels terrible about this, even though it’s not her fault. Meanwhile, it isn’t clear why April was there, a couple of hours away from her home. And significantly, Sam, who is nine, thinks Isabelle is an angel who will help him get to talk to his mother. Eventually, Isabelle gets to know Sam and his father Charlie, and she becomes close with both of them . . .
From that point on the story takes some twists that made it more interesting, but it’s still, basically, about relationships and the illusions that we have about them. Sometimes we see what’s in the picture, but sometimes we don’t. It’s a quick, pleasant read. I am reading this as my first book in 2013. I am hooked!